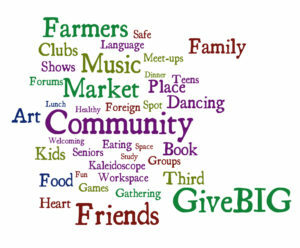 GiveBIG is the Seattle Foundation’s annual day of giving when folks across the region are encouraged to give to the things they love and value. We sure hope that Third Place Commons makes it onto your list this year! Or you tell us what you love! There will also be Dollars for Change hourly drawings from 8 AM to 8 PM worth an extra $2500 in donations. We’ll be in those drawings each hour that we receive a gift during that window, and we’ll receive one entry for each gift made to us during that time period. So the more gifts we receive during that time, the better our chances to win those extra funds, which will go a LONG way in a small, but mighty org like Third Place Commons. So if you make a gift, please consider making it during that window of time. Or schedule your gift now, because scheduled gifts will qualify for entry as well! Only your participation and your support make it possible to create real community in real space at Third Place Commons and at the LFP Farmers Market. 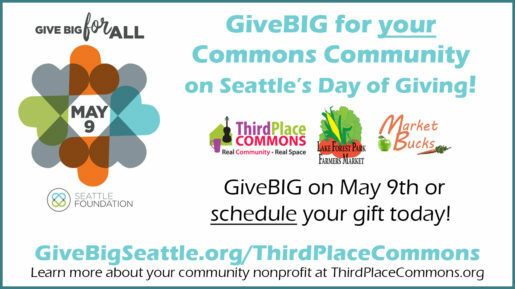 So please GiveBIG on May 9th. Or better yet, schedule your gift right now so you don’t have to remember next week! Next Post: The LFP Farmers Market Opens Mother's Day, May 13th!